OBJECTIVE: After introduction in the 1990s, the minimally invasive approach for lung resection is performed in specialized institutions. Various minimally invasive techniques have been proposed, with and without minithoracotomy. Variations in the technique include an anterior versus a posterior approach, either with or without rib spreading. This study discusses a technique using anterior minithoracotomy for access in robot-assisted VATS. METHODS: The introduction of the da Vinci Surgical System (Intuitive) in our clinical practice has allowed us to overcome some of the limitations of standard thoracoscopic instruments but presents other technical challenges. The robotic system is more rigid and requires additional space as compared to the standard VATS approach. Moreover, because of the anatomy of the chest, there is potentially increased risk of acute bleeding requiring rapid conversion to the open technique. The minithoracotomy, placed in the infra-mammary fold, is performed once the feasibility of the procedure is addressed, and serves as the access point for one of the robotic instruments, the port for the assistant at the patient’s side, as well the specimen retrieval site. 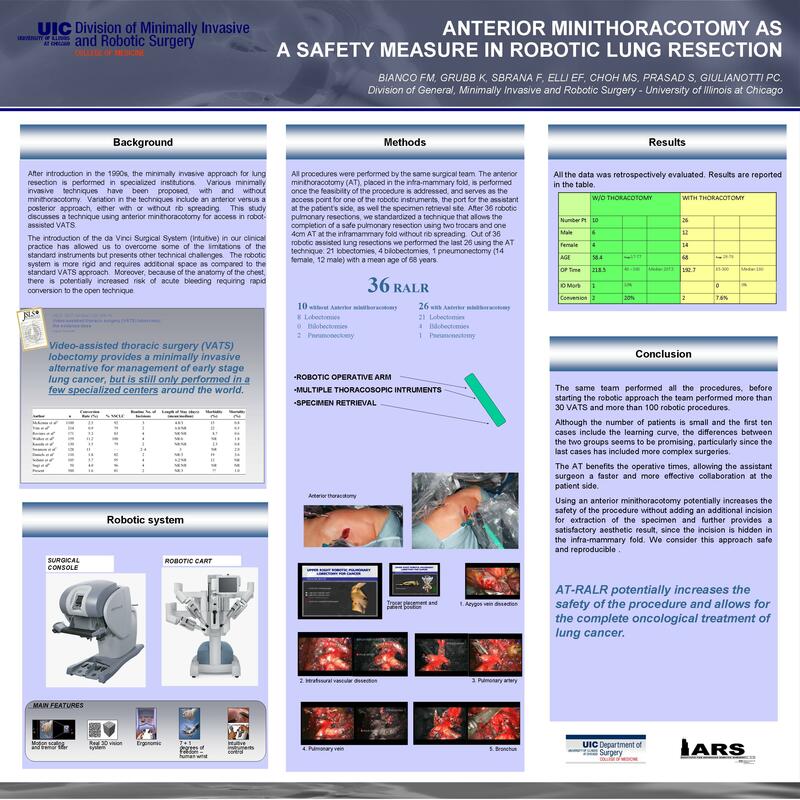 RESULTS: After 36 robotic pulmonary resections, we standardized a technique that allows the completion of a safe pulmonary resection using two trocars and one 4cm anterior minithoracotomy at the inframammary fold without rib spreading. Out of 36 robotic assisted lung resections we performed the last 26 using the anterior thoracotomy technique: 21 lobectomies, 4 bilobectomies, 1 pneumonectomy (14 female, 12 male) with a mean age of 68 years, no intraoperative morbidity or mortality was reported. CONCLUSION: Using an anterior minithoracotomy potentially increases the safety of the procedure without adding an additional incision for extraction of the specimen and further provides a satisfactory aesthetic result since the incision is hidden in the infra-mammary fold. We consider this approach safe and reproducible and present our technique and experience for discussion.